Liberty Bell’s Jadyn Mitchell drove through the Lake Roosevelt defense. 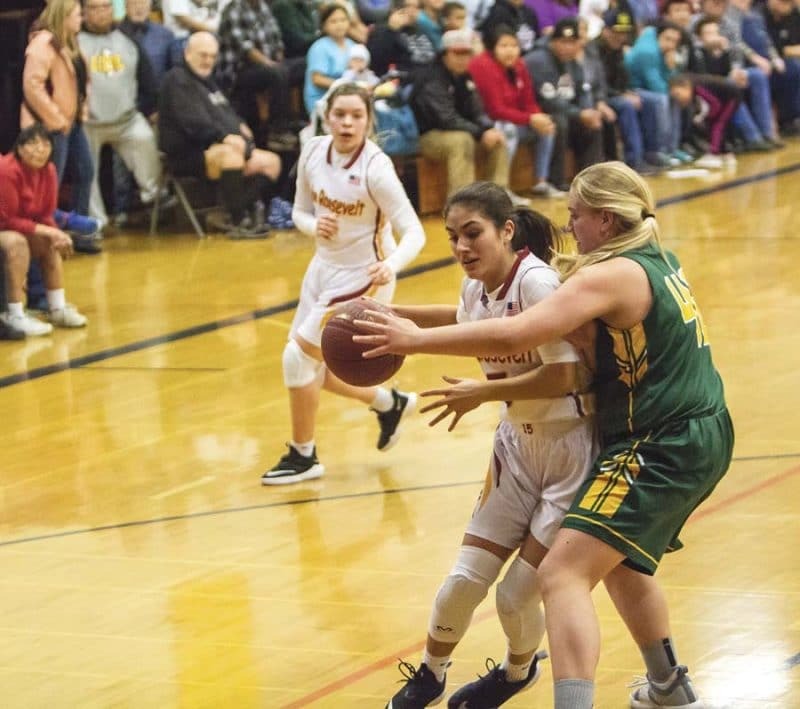 The Liberty Bell High School girls’ basketball team ran its win streak to 13 with a romp over Soap Lake last week, but came up just short of keeping the streak alive at Lake Roosevelt. The Lady Lions were able to play several members of the Liberty Bell girls’ JV team in a 56-22 home-court rout of the visiting Lady Eagles on Jan. 29. On Friday (Feb. 1), the Lady Lions were edged 51-49 by the Raiders, who have been on a late-season surge that guaranteed them a second-place finish in league play – or even a tie for first if Bridgeport somehow manages a win over league-leading Brewster on Tuesday (Feb. 5). With a win over visiting Oroville on Tuesday, Liberty Bell would finish regular season play at 13-3 (15-4 overall), in a second-place tie with Lake Roosevelt (13-3 league, 13-6 overall). That’s unless Bridgeport pulls off a major upset over Brewster (13-2 league, 14-3 overall) on Tuesday, which would leave Brewster, Lake Roosevelt and Liberty Bell with identical 13-3 records. Waterville-Mansfield stands in fourth place with a 12-4 league record (16-4 overall), after losing a showdown with Lake Roosevelt last week, 56-54. Seeding for district play will sort itself out after Tuesday’s games, with the top two seeds earning a bye in the opening round of play. Liberty Bell split its league games with Lake Roosevelt, Brewster and Waterville-Mansfield. Round one of the District 5/6 tournament starts Friday (Feb. 8), round two starts Saturday (Feb. 9). The district tournament is at Hanford High School. Against Soap Lake, the Lady Lions’ disruptive defense carried them to a 28-3 halftime lead, even as JV team members got playing time (that day’s JV game was canceled, leaving those players with eligibility for the varsity game). 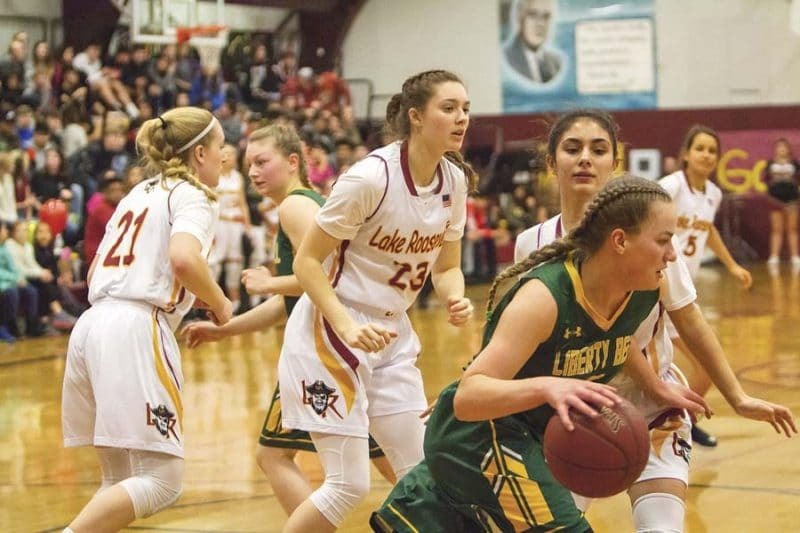 Liberty Bell scored another 28 points in the second half and very nearly held Soap Lake under 20 points, but for a late-game three-pointer by the Lady Eagles. Jadyn Mitchell topped the scoring column for Liberty Bell with 20 points, her fifth 20-points-or-more performance of the season, and just missed a double-double with nine rebounds. Sammy Curtis added 10 points and four steals. Tommie Ochoa scored nine, handed out five assists and harried Soap Lake with six steals. Mckenna Ott, who has played most of the season for the JV, made the most of her varsity opportunity with six points and five rebounds. At Lake Roosevelt, Mitchell again led the way with 17 points. Curtis and Ali Palm each added seven. Tuesday’s home game against Oroville was senior night, but there are no seniors on this year’s Lady Lions squad. Liberty Bell’s Hannah Bakke defended a Lake Roosevelt player in last week’s game.